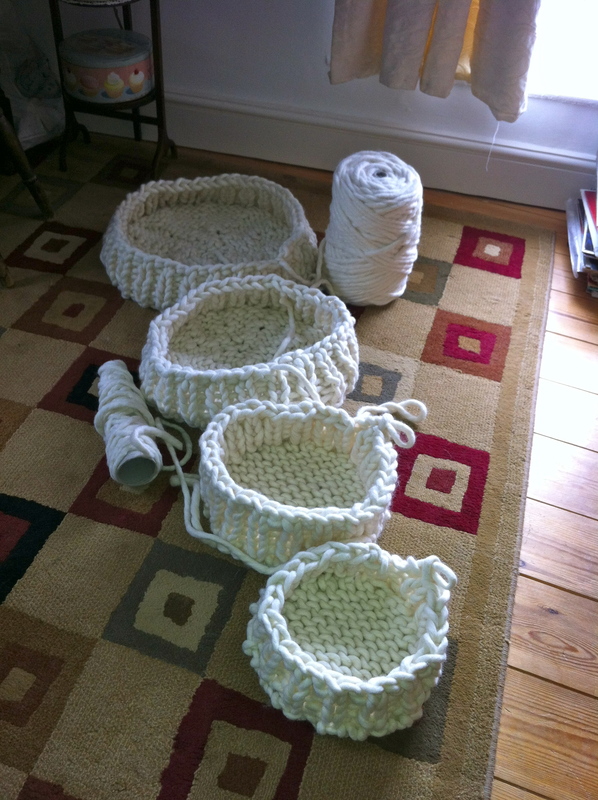 Fair bit of progress this week as I’ve knitted 4 complete baskets. 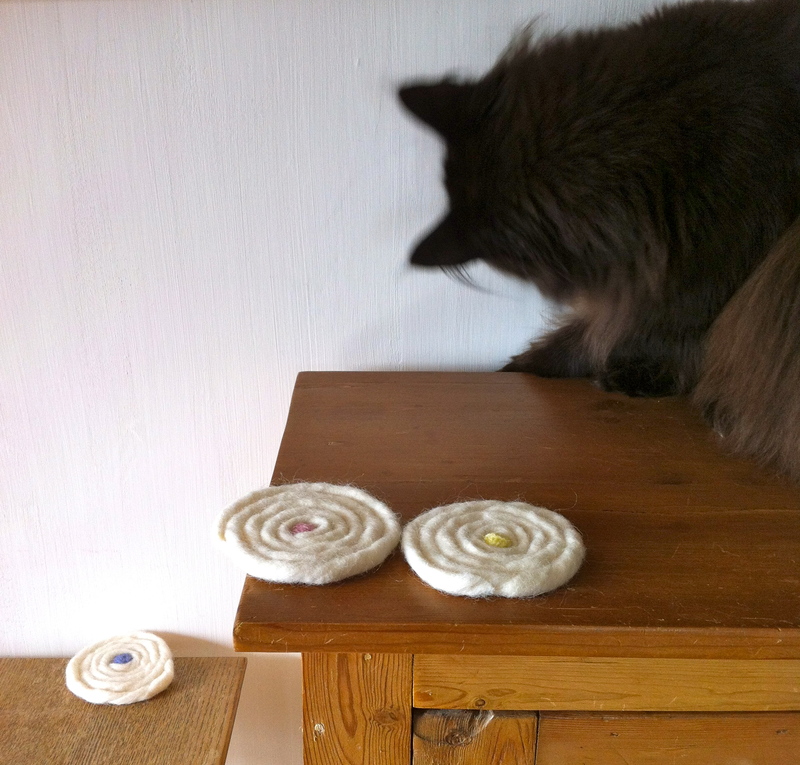 I’ve also had a total re-think about the construction which has given me the best result so far – with a nice flat bottom! 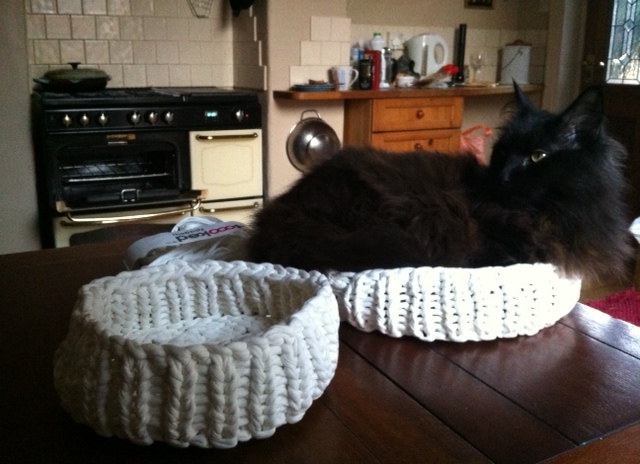 Monty is a big fan of the woollen cat basket and I knew he would hop in before long. I wondered which one he would go for. 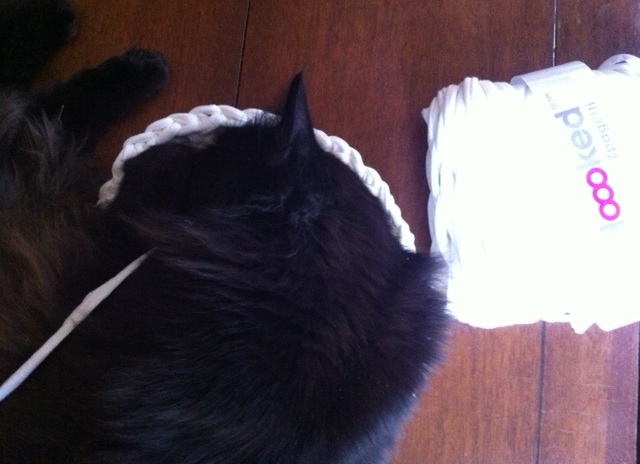 Spread himself out in the big one, or fold himself up into one of the smaller ones? Ah, he went for the big one. 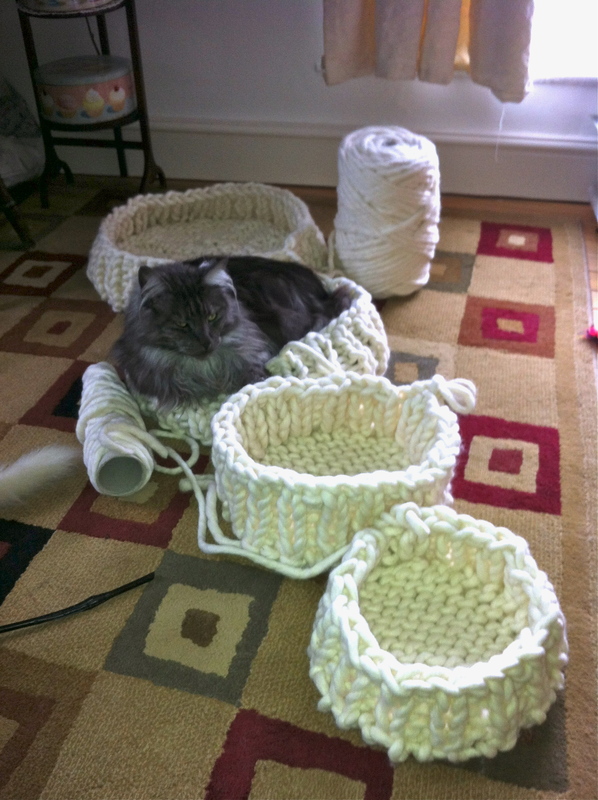 I tidied up, and discovered that 3 of the baskets make a nice little ‘basket nest’. 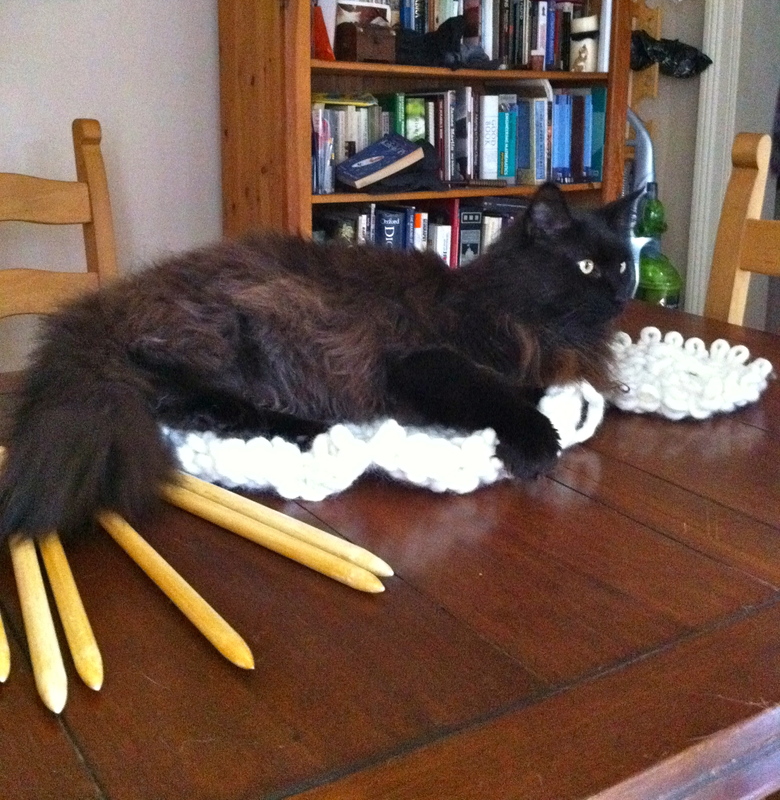 Seems Monty approves of this too. 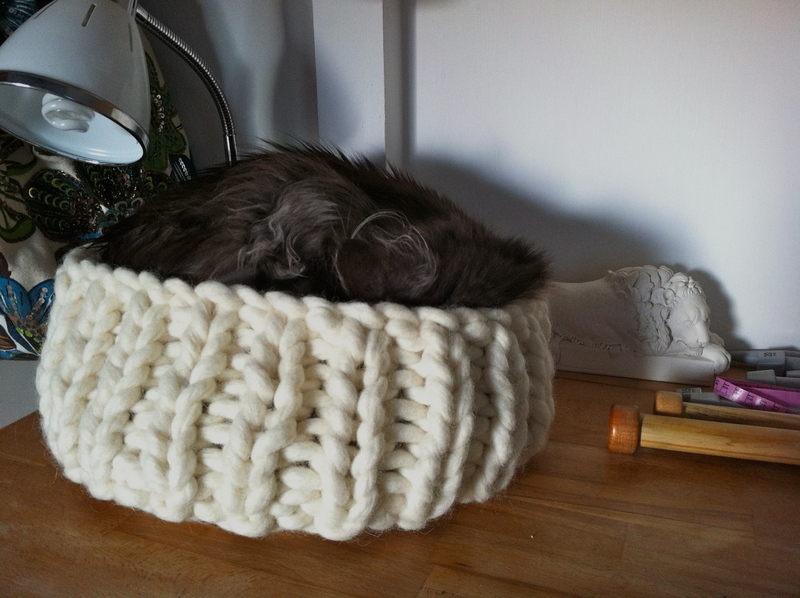 Herbie likes a woollen baskets to snooze in. 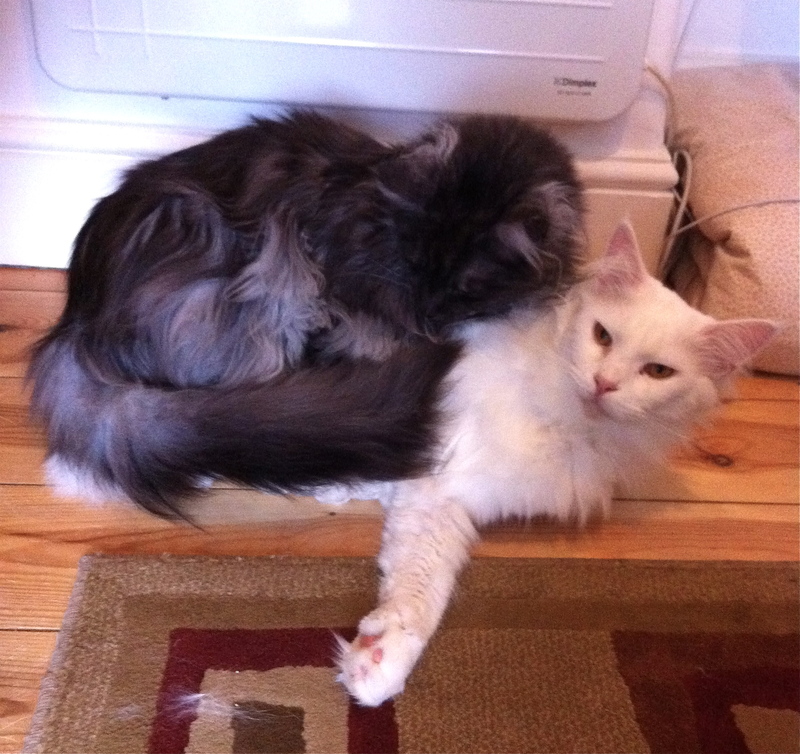 He squeezed himself into the smallest one so far, before I’d even fastened it off. Now for a radical departure: I’m going rectangular. Let’s see if I can finish this off before making a start on dinner. It doesn’t feel much like Easter here in Sheffield, what with all the snow and ice and not a single crocus or daffodil in sight. 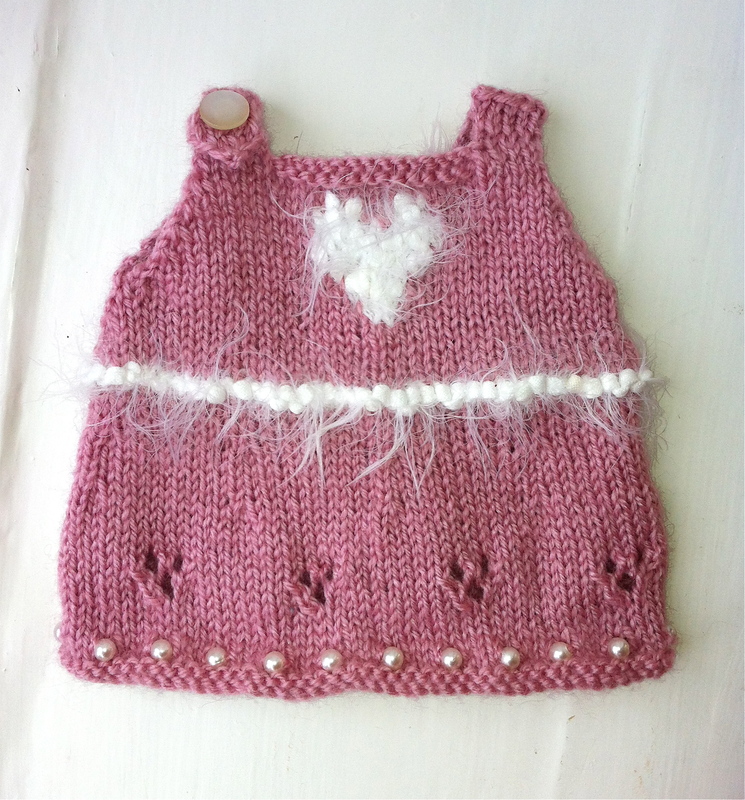 But making some clothes for a toy bunny is quite appropriately festive for the time of year. 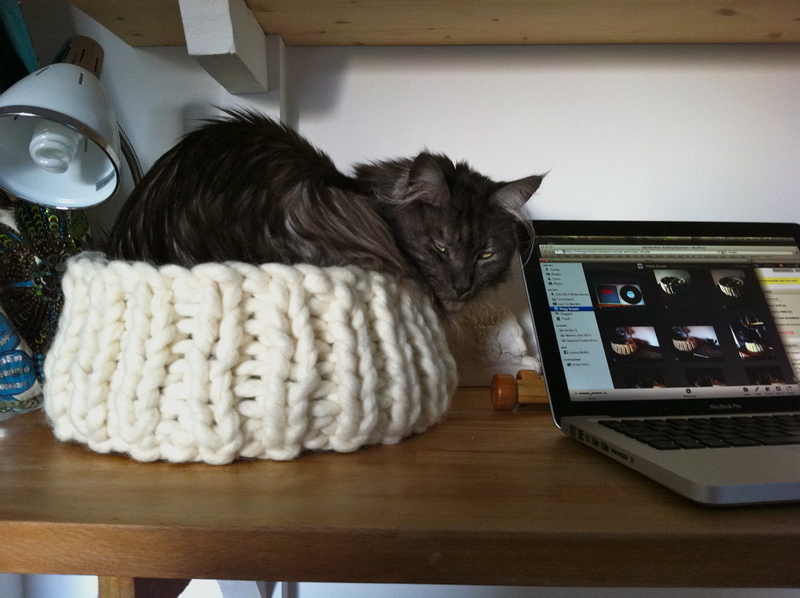 After spending weeks working on the extreme knitting cat basket, it was time for a change. So I put the giant needles away and started to think about Mrs Bunny’s new wardrobe. Mrs Bunny belongs to the daughter of a very dear friend. 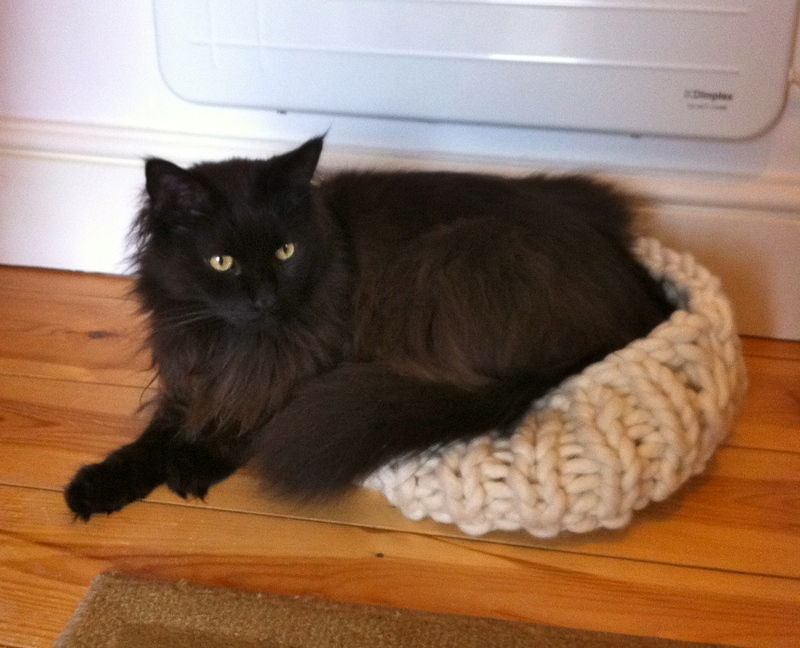 She has been so loved that she has lost all of her fur and looks quite undressed. A new set of clothes is in order. This is such a fun project for me. I don’t have to try to be stylish or subtle. Pink, fluffy, and cute is my design brief. Of course, Mrs Bunny isn’t here for me to constantly check the fit, so I am working from detailed measurements and hoping for the best. First I thought I would make a dress. I had a look through my stash and settled on a dusky pink DK, with a slubby, fluffy white contrast. My design included some pearly beads and a couple of heart motifs. As always, minimal sewing is my aim so I started at the hem on double pins and worked upwards in the round. I divided for the armholes and left one shoulder open for getting the dress over Bunny’s head. That was the plan, anyway. But the first attempt threw up some issues. The lacy heart motifs were supposed to be topped with a small bobble, so that they looked like rosebuds. But my bobbles were so messy that they had to go. Omitted, the rosebud became a heart. I found I was working in the round with the wrong side facing, so every row was a P row. 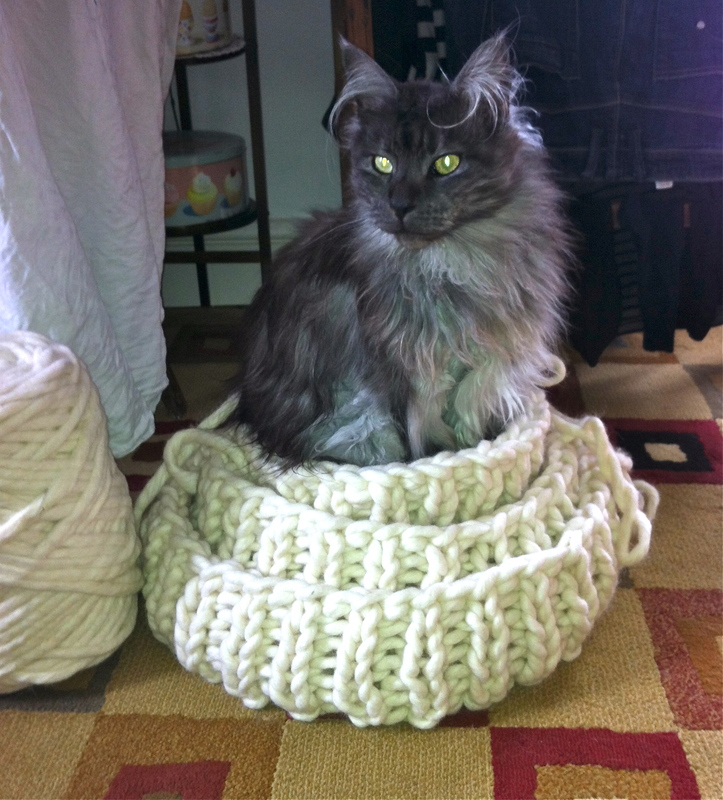 This meant I had to convert the pattern for the lacy rosebud/heart from knit-based to purl-based. I managed to do this OK, but why make it this hard? Why not just work with the right side facing? The other problem with working purl rounds with the wrong side facing, was that my decreases were untidy. I was placing some decreases as I progressed up the skirt to the waist, to create a flared shape. I found that P2 together was not as neat and subtle a decrease as K2 together. I also had not placed the decreases evenly between the heart motifs. Then I checked the measurements and realised that Mrs Bunny’s dress was far too big. Time to unpick the whole thing, address all of these issues and start again. 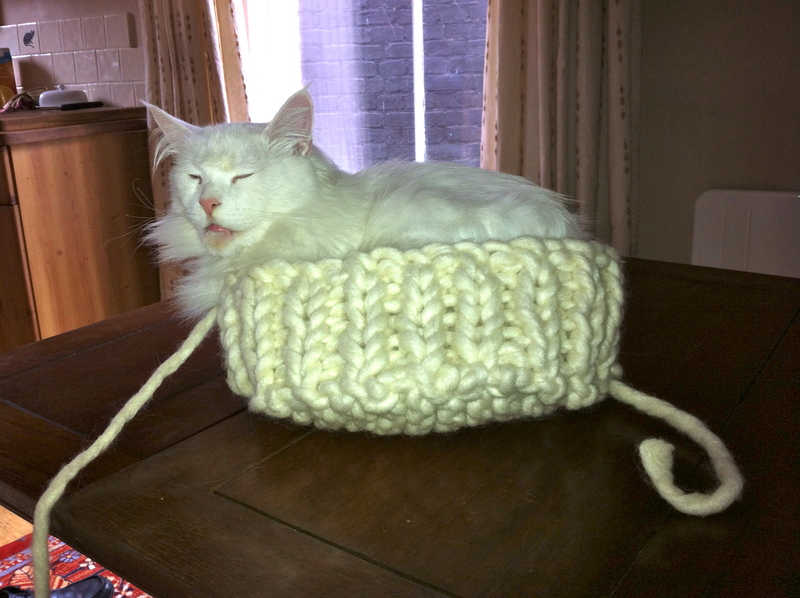 For some reason I found it really hard to cast on 88 stitches, join in the round and have the right side facing. 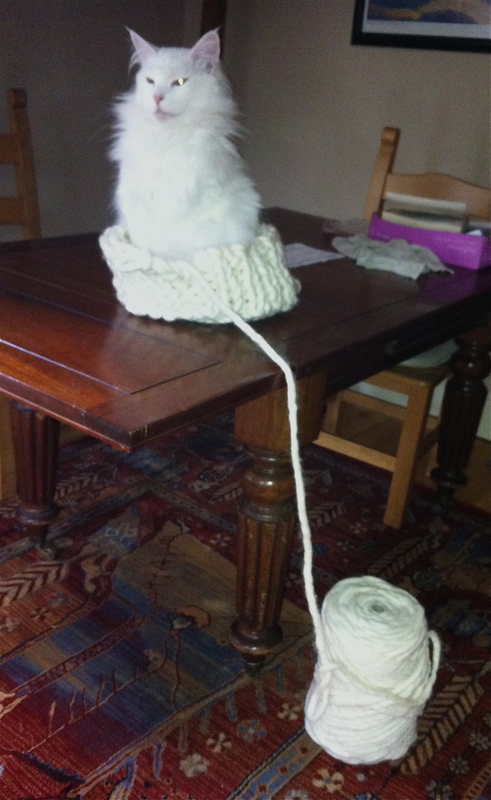 So I knit one row first, then joined in the round. That did the trick and I was away. The lacy heart motifs read easily off the page for K rows. I found the optimal spot for my decreases and worked them beautifully with K2tog. I found a pearly button to finish off the shoulder fastening. Ain’t it pretty? Now I’m making a tweedy jacket to go with the dress. Fingers crossed that they fit! New double pins are here! My hand-turned double pins have finally arrived! Two different sizes, each 40 cm long. 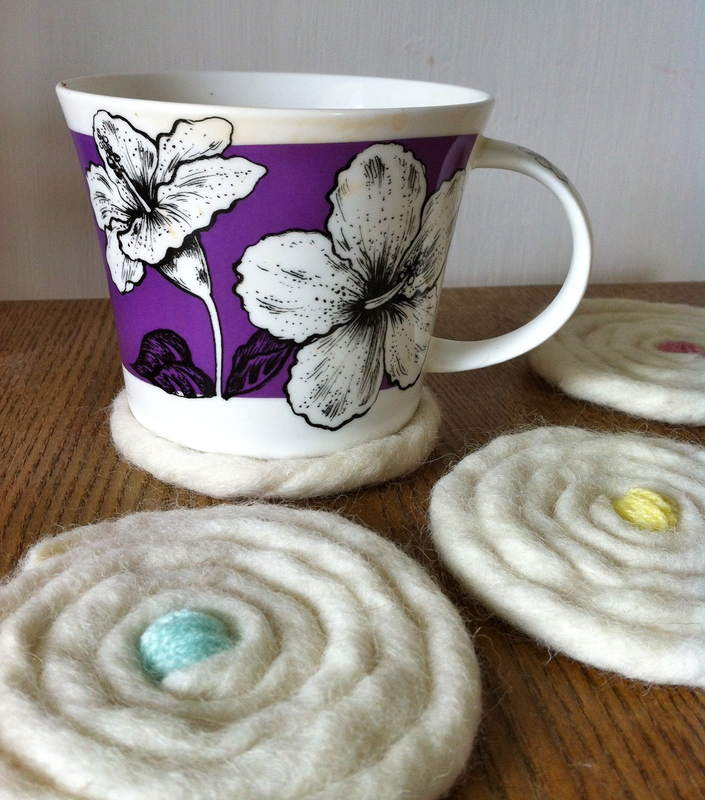 Now for the first time I can make seamless baskets and containers using thick semi-felted wool. 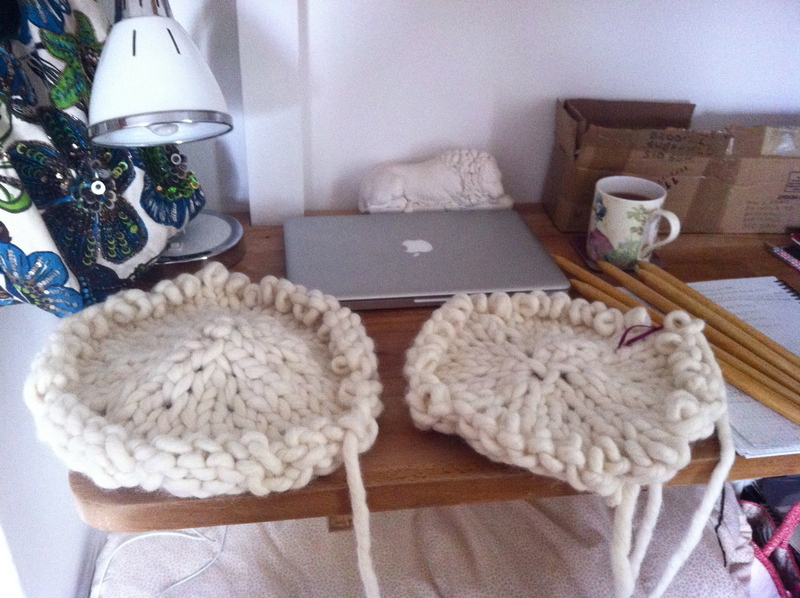 So I set off knitting the base according to my existing pattern which I wrote for the seamed baskets. 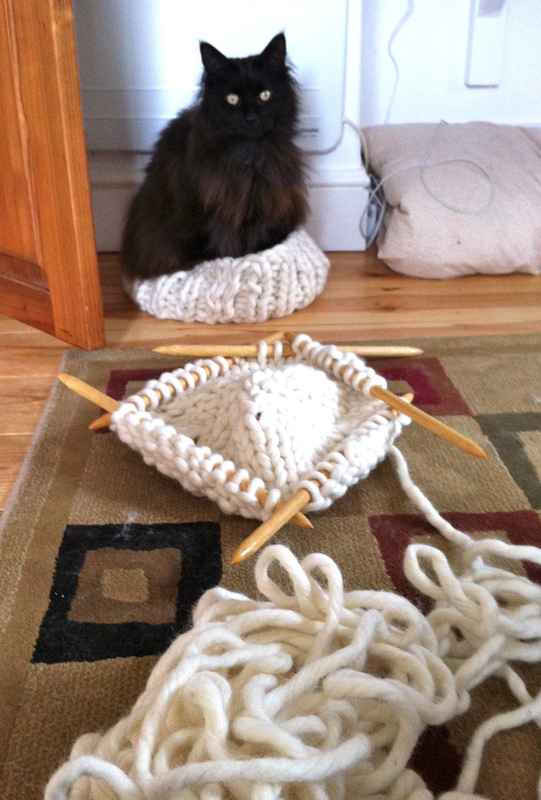 Here’s Larry checking out my progress. 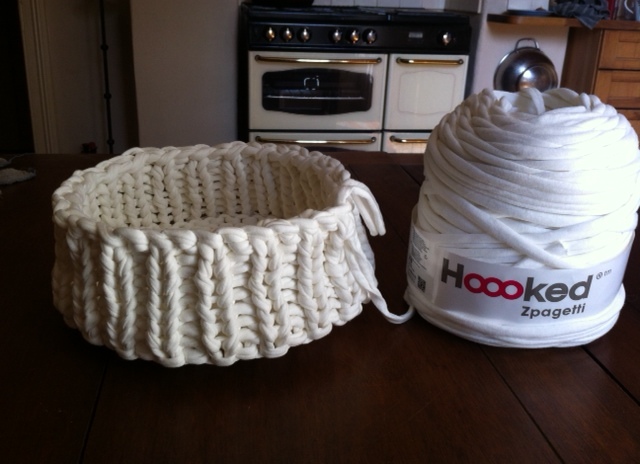 The old basket is nowhere near big enough but it was as large as I could go on two pairs of ordinary 20 mm needles. A convenient facet of working on this large scale is that it’s easy to pull the needles out without losing track of the stitches. Every few rounds I would pull out the double pins and check the lie of the circle so far. I wanted it to be as flat as possible. 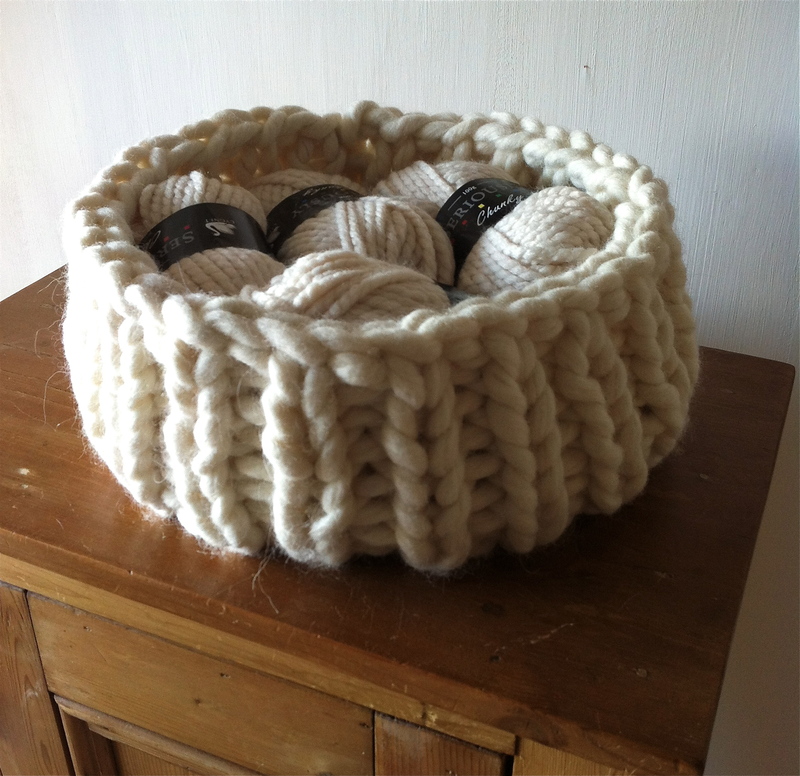 A basket needs a nice flat base. 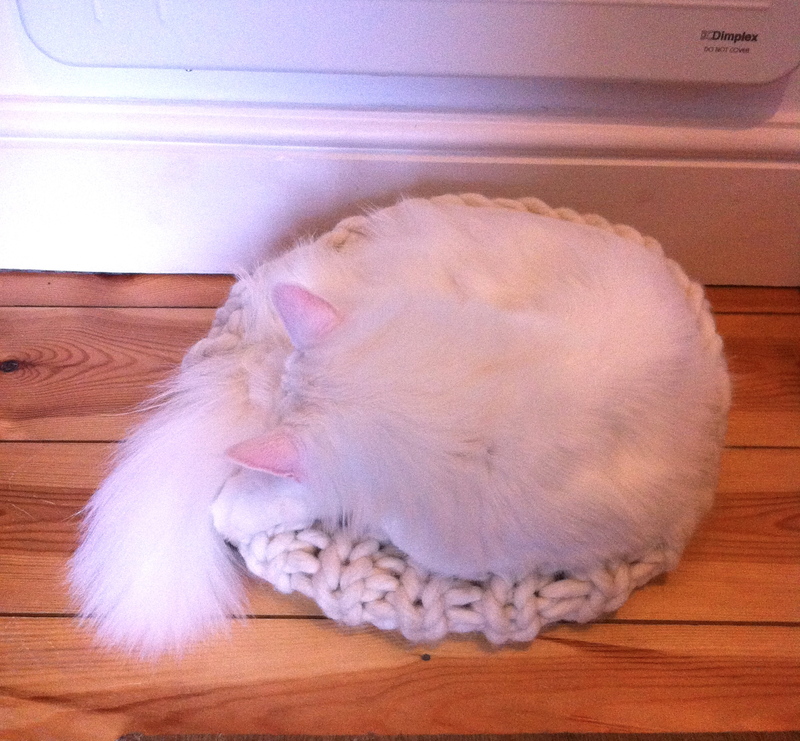 Unfortunately, I appeared to be knitting a dome. I unpicked my work a few times and tried different patterns of increases. But the dome would not go away. Hours went by and I wasn’t getting anywhere. 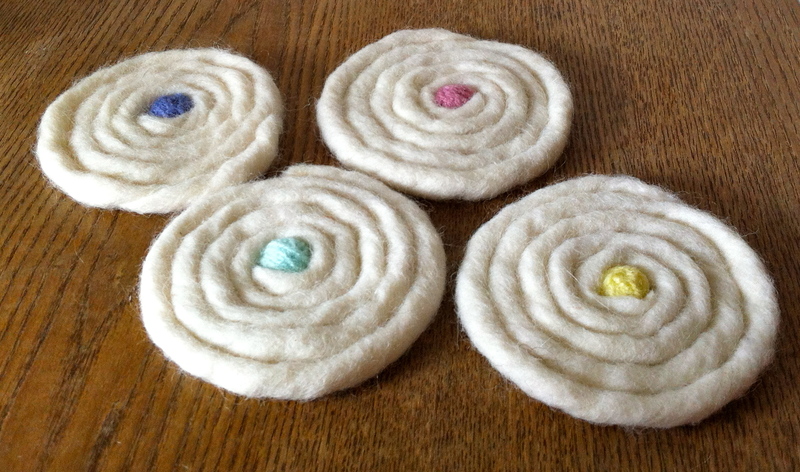 Why was working this pattern in the round so much harder than on two needles? Was the puckering caused by too many increases, or too few? I looked at my work again, and realised I was reading it incorrectly. I had to take a completely different approach to working the increases. Keeping the unsatisfactory domed circle as a guide, I found the other end of my yarn and started again. Exhibit A: the dome. 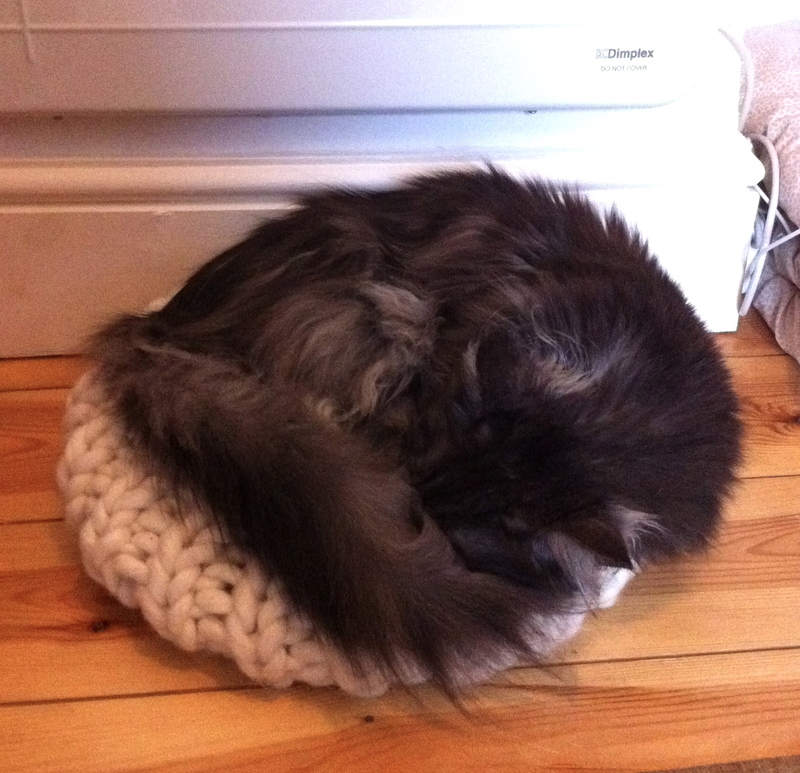 Exhibit B: the circle. We met some friends for dinner at a restaurant. Even then I was thinking, ‘maybe I should have started off with 4 stitches instead of 6. I’ll try it tonight before I go to bed’. I was determined to get a better result, to the point of obsession. I started to completely remove the double pins after every round, so that I could press my circle out flat and see how flat it really was. 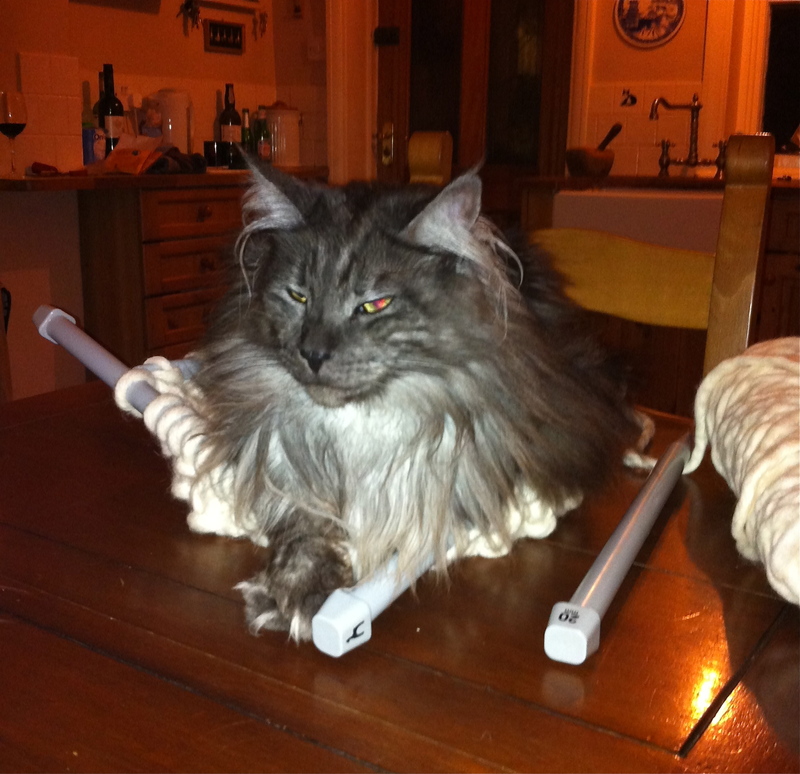 Here’s Larry helping me with my assessment. 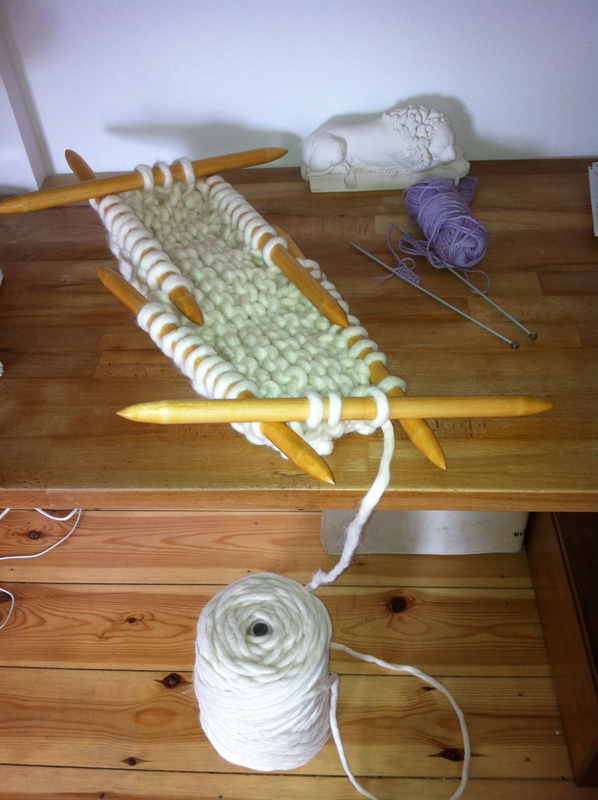 Through all the hours of trial and error, I was learning a lot about the fibre and the way it behaves on those needles. All good experience, and good experience is never wasted. The basket base is not completely flat, but it is definitely no longer a dome. And in the finished article, the fibres will settle, and the base will flatten with use. My basket base now measures half a metre (20 inches) in diameter, and I’m halfway up the sides. 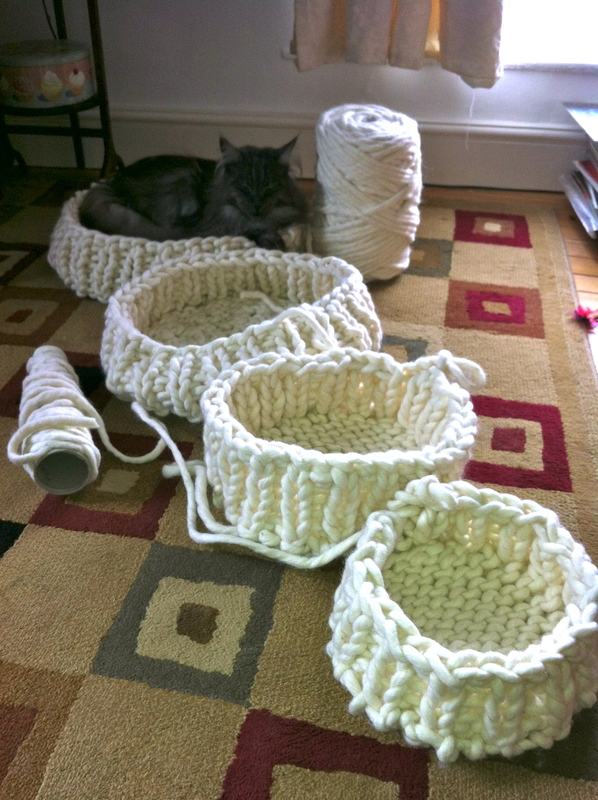 I am hoping that I will have enough wool left to complete it, without having to unpick my former prototype. 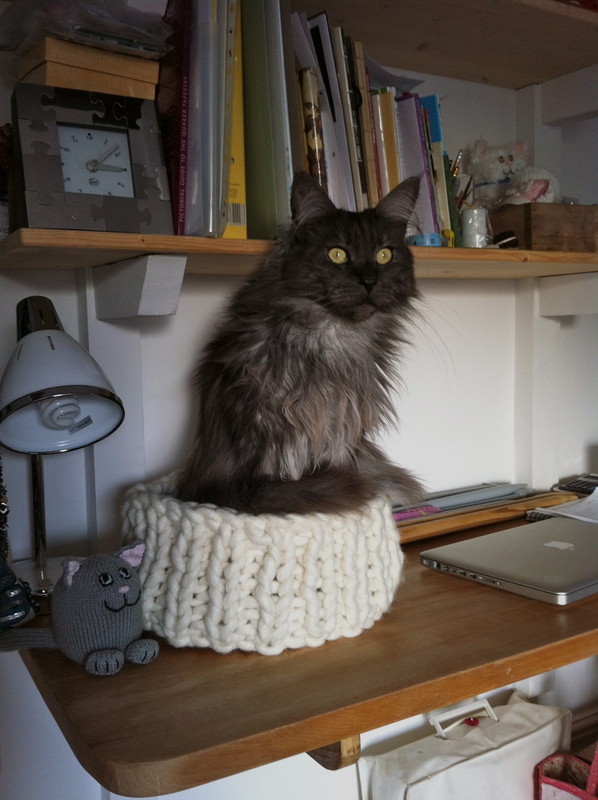 But I won’t be working on it tonight, because at this moment Herbie is settled down in it, having a good wash and a stretch, framed by the five double pins, and Monty is making do with squeezing himself into the little basket alongside. 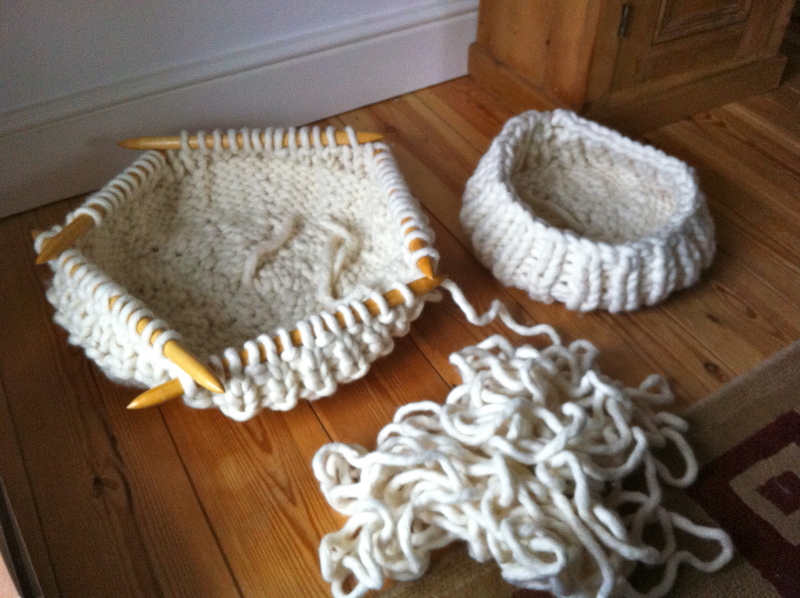 I just heard from my lovely Uncle that he has made me the two sets of oversized double pins I need to make the biggest and best possible wool baskets. 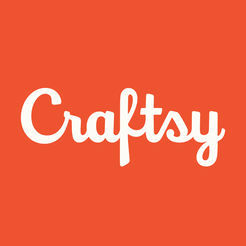 According to my many prototypes and pattern re-writes, this is the way forward. 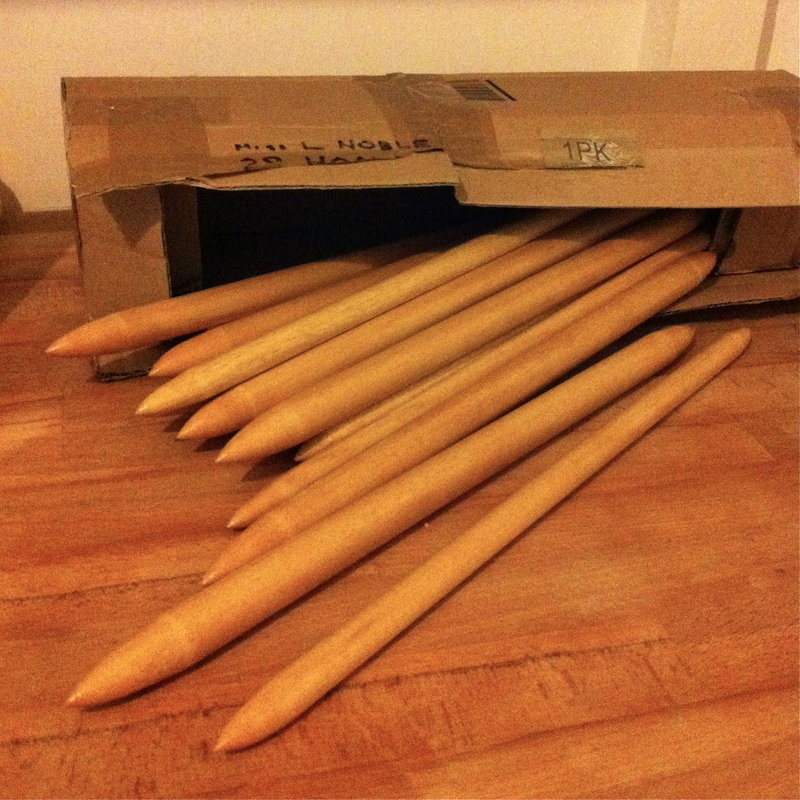 My Uncle is retired and doesn’t do much woodworking any more, but just for me he sourced the wood and turned the needles to my measurements. 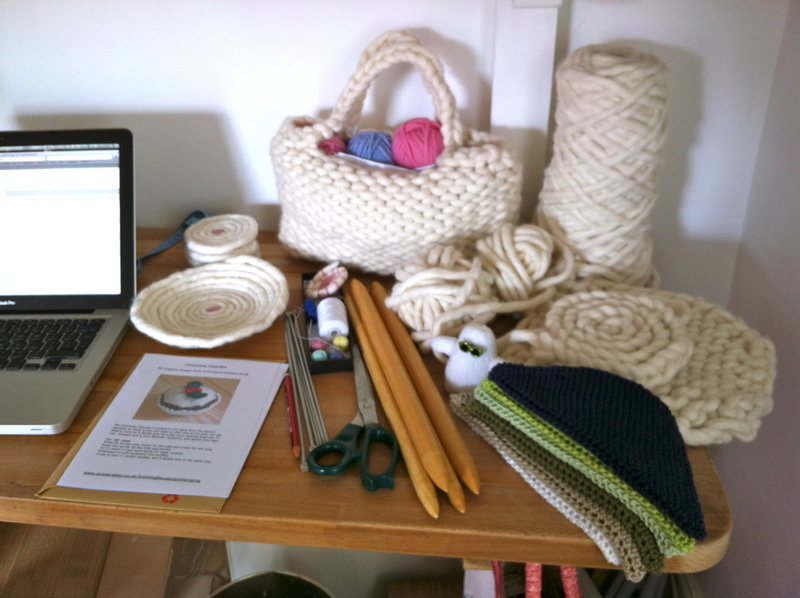 I am a very, very lucky knitter. 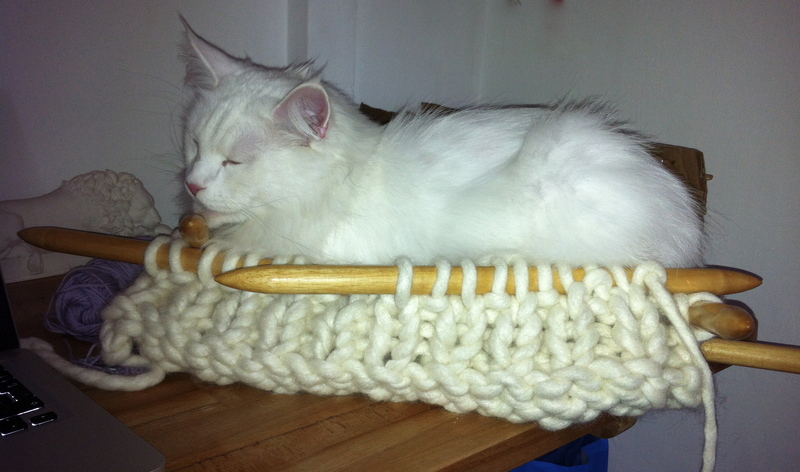 Monty has been asking for a bigger basket for some time. 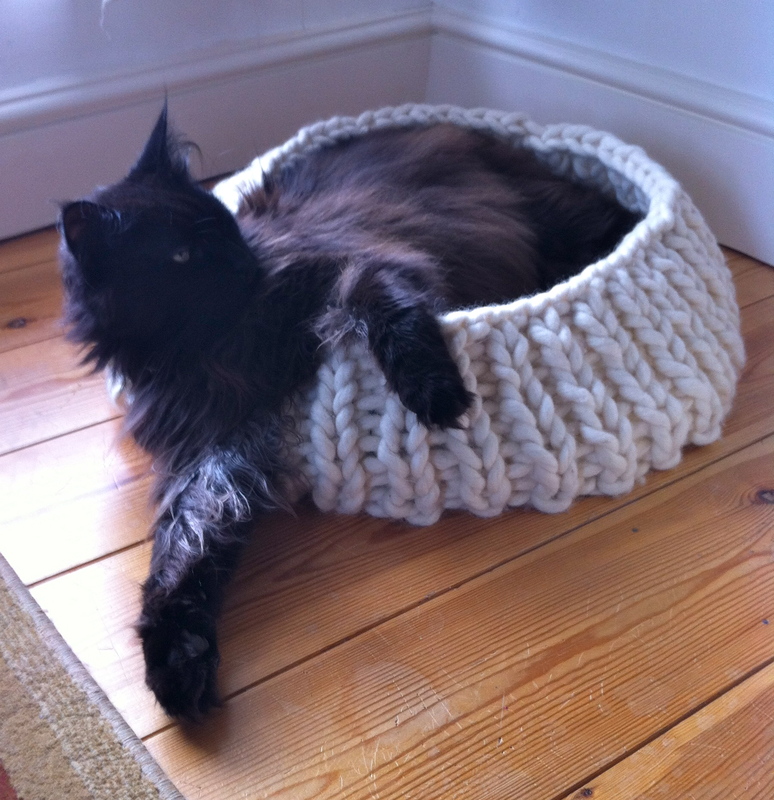 Now Monty is able to fold himself up quite small, but even so, this basket is a tight fit for him. Larry on the other hand, just spills out of it. …when he gets the chance!